Using proven technology, this category uses a rotary drum to produce consistently accurate sizing of almost any waste type. Combined with high fuel efficiency, reliability and one man operation, this means very low operating costs. The Drum Screen is commonly known as Trommel Screen. The machines have the ability to give 2 or 3 fractions and quick drum changes enable you to change size grade within minutes, from 5-100mm. 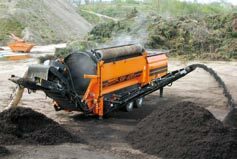 Fitted with long reach and high clearance conveyors to assist stockpiling, some models can be powered electrically or operated indoors with a removable motor unit resulting in zero indoor emissions. 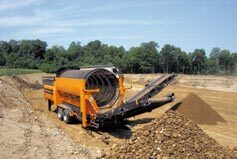 Our SM 620 works with a trommel with a 2 m diameter and a length of 5,5 m. The trommel wall thickness is 6 – 12 mm. Different meshes are available e. g. square holes, aggered squares and round holes. The trommel of the SM 720 has a 2 m diameter and a length of 7,1 m. The trommel wall thickness is 6 – 15 mm. Different meshes are available e. g. square holes, staggered squares and round holes.